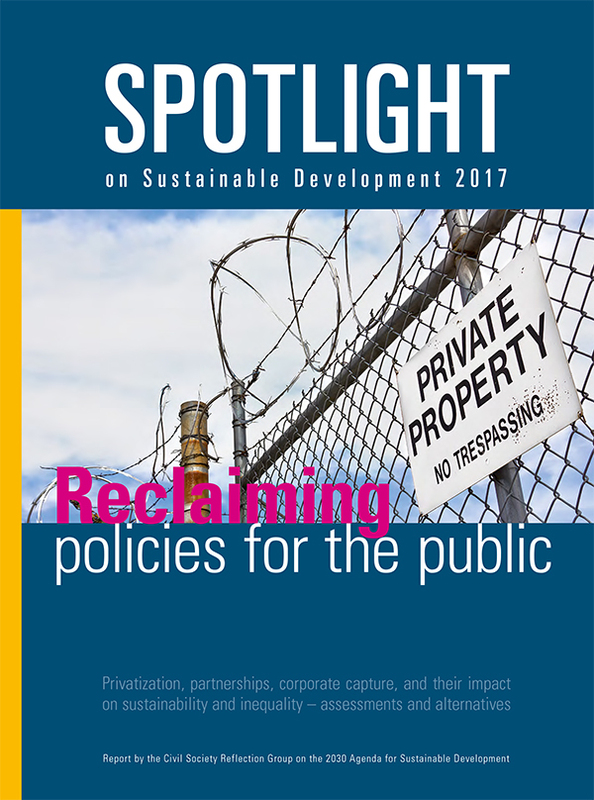 Unbridled privatization, corporate capture and mass-scale tax abuse are blocking progress towards the Sustainable Development Goals, argues a new report by a global coalition of civil society organizations including the Center for Economic and Social Rights (CESR). The report, Spotlight on Sustainable Development 2017, is published today as the High-Level Political Forum on Sustainable Development (HLPF) gets underway in New York. The HLPF is a global stock-taking of progress under the 2030 Agenda for Sustainable Development agreed in 2015. Co-published by the Reflection Group on the 2030 Agenda, an initiative of six international NGOs and southern-based networks including CESR, the Spotlight Report provides an important complement and counterpoint to the official discussions at the UN headquarters. The civil society shadow report provides the most comprehensive independent assessment of the implementation of each of the 17 Sustainable Development Goals (SDGs), based on experiences and reports by national and regional groups and coalitions from all parts of the world. CESR and its partners have expressed alarm in the past about growing corporate influence over the sustainable development agenda. This report marks a major effort to cast a critical eye over the way that States and the UN system are privileging corporate-led ‘fixes’, such as unfettered privatization and public-private-partnerships (PPPs), despite evidence in many cases of negative outcomes in terms of human rights and inequalities. Given the glaring deficiencies in the official SDG monitoring and review system so far, such stringent civil society-led accountability efforts are ever more important. “In the 2030 Agenda governments committed to a revitalized Global Partnership between States and declared that public finance has to play a vital role in achieving the SDGs. But in recent decades, the combination of neoliberal ideology, corporate lobbying, regressive fiscal policies, tax avoidance and tax evasion has led to a massive weakening of the public sector and its ability to provide essential goods and services," the Spotlight Report states. It argues that the same corporatized strategies and fiscal and regulatory policies that led to this weakening have enabled an unprecedented accumulation of individual wealth – with economic inequality reaching historic highs – as well as increasing market concentration. Kate Donald, Director of CESR’s Human Rights in Sustainable Development program, authored the report’s chapter on Goal 10, through which governments pledge to reduce inequalities within and between countries (the chapter is also available in Spanish). In the chapter, she explores how corporate influence over tax policy has resulted in increasingly regressive fiscal regimes, which drain governments of the resources necessary to tackle inequality. The chapter describes how corporate capture creates an ‘inequality trap’, whereby growing economic inequality heightens the ability of corporations and rich elites to manipulate policy-making to protect their wealth and privilege. It also examines how – in addition to the myriad detrimental domestic effects – corporate lobbying for tax incentives, financial secrecy laws in tax haven countries and the drive to lower effective tax rates on businesses all have profound effects on human rights enjoyment globally, depriving poorer countries of the resources they desperately need to realize economic and social rights. The findings build on CESR’s 2016 policy brief on Goal 10, From Disparity to Dignity, which sets out a human rights-centered agenda for tackling economic inequality within and between countries, an important contribution to the emerging debate on the role of the human rights movement in addressing economic inequality as a critical issue of our time. The Spotlight Report will be disseminated and discussed at various events at the High-Level Political Forum over the next two weeks, and will be the subject of an in-depth dialogue at a side-event on Tuesday 18 July. CESR will also be involved in two other side-events. On Wednesday 12 July, CESR will co-convene a side-event - Opportunities that Fiscal Policy, Open Contracting and Tax Justice Hold for Gender and Economic Equality under the SDGs - with Christian Aid, INESC Brazil, Femnet and Hivos East Africa on fiscal policy and inequalities, at which we will discuss our work on tax and women’s rights, as well as our ongoing project monitoring the effects of fiscal policy in Peru on inequalities. On Thursday 13 July, we have co-organized an event - The function of International Human Rights Mechanisms and the role of National Human Rights Institutions in supporting the implementation of the 2030 Agenda - with Civicus, the Office of the High Commissioner for Human Rights, the UN Development Programme, and the Global Alliance of National Human Rights Institutions, which will examine how human rights bodies (in particular national institutions and international human rights oversight mechanisms) can engage in SDG implementation and monitoring. In this regard, CESR will be publishing its forthcoming report with UN Women, Seeking Accountability for Women’s Rights through the Sustainable Development Goals, looking at the variety of mechanisms for strengthening accountability for women’s rights and the gender equality commitments of Agenda 2030. So far, the High-Level Political Forum’s contribution to meaningful accountability for the 2030 Agenda’s commitments is very questionable. However, CESR and its allies and partners will be pushing on several fronts to make it a useful space for civil society scrutiny of States’ actions towards the 2030 Agenda, and whether they are compliant with their human rights obligations. OpenGlobalRights debate: Economic inequality - Can human rights make a difference?